Two weeks left of soccer! Come join us on August 21 and August 28! Not a lot of explanation needed here! 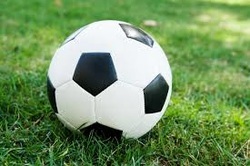 Come out and join us for a friendly game of pick-up soccer, starting at 6:30pm on the Our Lady of Lourdes field and going until sundown (or until everyone is too tired to play anymore). Feel free to just show up - come late, leave early, no worries! And feel free to invite friends and family - the more, the merrier.